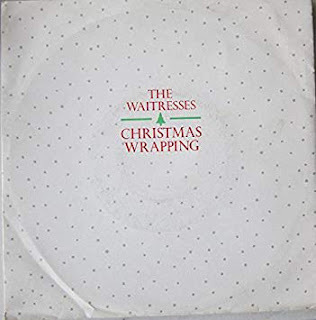 This weekend, ageing alt-rock hipster Twitter was going nuts over a tweet from Andy Partridge (XTC) in which he lavished praise on that holiday classic Christmas Wrapping by Akron's own The Waitresses. "So much about this that I wished i'd done," Partridge said. "The cheekiness." Waitress scribe Chris Butler on Facebook responded simply, "Speechless." Indeed. If I received such praise from the man who wrote Dear God I would also be gobsmacked. Had his number, but never the time. Perhaps it is that sentiment, about never having the time, which makes the story part of the song something everyone relates to. Butler was commissioned by a record label to create a Waitresses song for a compilation album of indie holiday tunes, and he found the idea of writing a Christmas song (especially in the middle of summer) to be as oppressive as the holiday itself can be. This was on HEAVY seasonal rotation at our house... and still is. So much about this that I wished i'd done. The cheekiness. "I hated Christmas," he told reporter John Petrick in 2005. "It wasn't about joy. It was something to cope with." And so, he created a narrative of a young adult - not a parent or a child - working, dating, getting sick, looking for connection, settling for a solo Christmas dinner in her apartment before finding that last minute date at the grocery store. Truth be told, I was not hip to this song when it was released. I was thirteen and not as cool as all that. But there was an early 80s revival in the mid-1990s, as Gen Xers were recovering bits of their lost childhood, and this record went to the top of my personal holiday playlist in a big way. Because of nostalgia for the New Wave era. Because it’s downtown and upbeat. Because it’s about striving and failing and being happy with what you have. Because the late Patty Donahue knows what boys like, she’s a square peg, and she can use my comb.